For about the past month Mario and I have been planning a friendly box battle of co-signers 2008. Well the product just so happened to release today so I went and picked up my box. I was lucky enough to get a free box from All C's which is a great local hobby shop here in Colorado. Since they gave me a free box I will be posting their Ebay name, email, and business cards on my sidebar. They sell 100-300 cards a day up on Ebay or in the shop. I have known them for almost 11 years and feel honored to get a free box from this family owned/operated business. Mario and I both post video breaks of our boxes. We both do a little review of the breaks. Post a voters poll so people can vote on the best box. 2 guest judges write a post about who's they think is better. This is your standard co-signers baseball. 12 packs per box, 6 cards per pack, 3 autos including 1 co-signer. This year instead of 9 parallel cards you get 12 and there is a chance to get a quad singed or cowhide signed card. The base cards are similar to last years co-signers gray and white background with a color action photo of the player. The parallels are still colored and shiny with the color determining the serial number. Some of the parallels changed to only having one player instead of 2 which is probably the reason you get 12 now instead of 9. The back of the card didn't change much either. They still have a nice color picture on the back and the previous 3 years of stats. 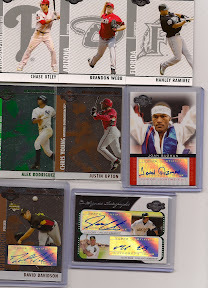 Lastly, instead of Moonshots autos they have an array of boxers which alot of collectors have been very interested in. From talking to Mario at Wax Heaven, it sounded like he was going to be picking up a box today. Be sure to keep your eyes peeled from his break in the near future. Since I really like co-signers I'm very happy with this box and the product. I really hope that Mario gets a better box though he hasnt opened cards in a while. Thanks for watching be sure to think about who's box you like better, voters polls should be up soon!! is that yadier molina you pulled for trade?